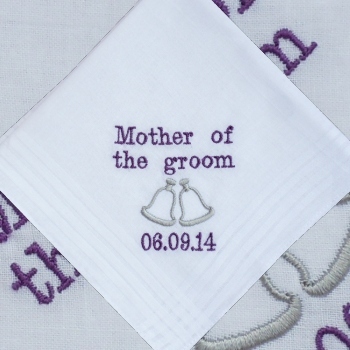 Mother of the groom wedding handkerchief gift. Mother of the groom wedding handkerchief gift. A lovely keepsake gift for the mother of the groom on the big day. Single white handkerchief embroidered with the title Mother of the Groom, a bells motif and your special wedding date. You can choose to have a standard ladies handkerchief or a cotton with floral lace trim handkerchief.